We have found that many of the most successful hearing conservation programs have placed a high emphasis on education at all levels within the organization. Our Train The Trainer Workshops are designed to enable participants to provide better in-house training and supervision of employees within the hearing conservation program. Additionally, this “trickle-down” approach to safety education can go a long way to improve employee attitudes and increase the level of worker compliance with company safety policies. Training specific to proper fitting of hearing protection is our most requested workshop, but any aspect of hearing conservation can be addressed. Participants are provided with the knowledge and tools needed to provide hearing protector fittings to their own employees. 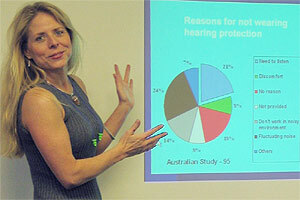 Many clients pair this workshop with our Individual Hearing Protector Fitting service. With this combined service option, the initial fittings to all employees are provided by our technician or audiologist. New hires and STS follow up fittings can then be performed by the employer in-house or alternatively by WAS at the time of the annual testing. Regardless of participation level, key employees within your organization will be better equipped to deal with employee questions and issues regarding hearing protection as they develop, enabling a year round approach to safety. We have frequently presented workshops designed specifically by the request of individual clients. Please let us know if you would like us to customize a training workshop for you.